The purple is Regents Place and the grey is The Thames. These polishes were GORGEOUS! I would compare both of these in formula to Julep and Illamasqua. Yes! They were THAT good!!!! They applied smoothly and easily and were opaque in one coat. The purple is almost metallic in nature. A deep royal purple with intense pink micro shimmer. The Shimmer doesn't translate on the nail into seeing pink, but it picks up and reflects the light beautifully. The grey is a smooth clean cement grey crème. It may not be the most original or interesting colour there is, but its beautiful. Not too dark, not too light, just right. These two definitely have me excited to try the other regular polishes by this brand! They are BEAUTIFUL!!! 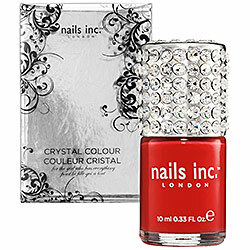 I am a crystal kind of gal; but I wouldn't pay double just for the lid! I wish I had a Sephora here, there is a counter at the JC Penny. Where are you? I want to at some point cross the border to hit an american sephora. i want the normal nails inc. the closest american sephora only a few hours drive away would be in the jc penny in Fargo. do they not carry nails inc?